One of the most extraordinary books ever published. These four volumes record the visions of the famous 19th-century Catholic mystic; Ven. 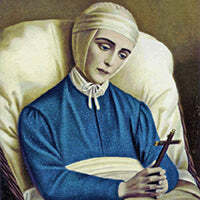 Anne Catherine Emmerich; a nun who was privileged to behold innumerable events of biblical times; going back all the way to the creation of the world. She witnessed the fall of the Angels; the sin of Adam; Noe and the Flood; the lives of St. John the Baptist; St. Anne; St. Joseph; the Blessed Virgin Mary; and St. Mary Magdalen. Also includes the birth; life; public ministry; Crucifixion and Resurrection of Jesus Christ; as well as the founding of His Church. Besides describing persons; places; events and traditions in intimate detail; Anne Catherine Emmerich also sets forth the mystical significance of these visible realities. Impr. The Bad: some events are less interesting, making the over-the-top level of detail impossible to get through; tedious amount of description relating to clothes, ceremonies, rituals, and surroundings. Considering the fact that it took half a dozen books to contain all of her visions, it’s no surprise that Anne Catherine Emmerich is one of the most talked about mystics today. It should be noted that all of her books possess an Imprimatur and Nihil Obstat, as her visions perfectly complement Christianity’s written tradition. Before fully detailing the life of Christ, Emmerich goes into a number of her visions relating to the Old Testament, starting off with Creation. This is one the most exciting, enlightening, and unbelievable of all the chapters in this volume. Emmerich’s revelations provide intimate portrayals of so many Biblical figures. Notable figures include, St. John the Baptist, St. Anne, St. Joachim, Melchisedek, Noah, Herod, Lazarus, and most of the patriarchs in the genealogy of Jesus. These visions help make Biblical events come alive by presenting robust descriptions of settings and interactions, effectively putting us there within each moment.